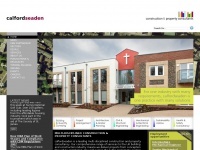 calfordseaden is a leading construction and property consultancy, including chartered surveyors, project managers, architects, civil & structural engineers, mechanical & electrical engineers, sustainability advisers and health & safety consultants. With offices in Orpington, London, Birmingham and Winchester we work across the UK and aboard. A profile of Calfordseaden.co.uk was found on the social network Twitter. The web server with the IP-address 212.71.237.226 used by Calfordseaden.co.uk is run by Linode and is located in Great Britain. This web server runs 3 other websites, their language is mostly english. The websites of Calfordseaden.co.uk are served by a Apache web server using the operating system Ubuntu (Linux). The software used to serve the webpages was created by using the programming language PHP. For managing the data of the webpages the CMS Drupal in the version 7 is used. HTML+RDFa 1.1 is used as markup language on the webpages. To analyze the visitors, the websites uses the analysis software Google Analytics. The website does not specify details about the inclusion of its content in search engines. For this reason the content will be included by search engines.